Antibodies to collagen type II (anti-CII) are found in a sub-population of rheumatoid arthritis (RA) patients. In joint inflammation CII epitopes are exposed to anti-CII, with possible formation of surface-bound immune complexes (IC). We investigated whether surface-bound CII anti-CII IC can induce cytokine production from mononuclear cells and the mechanisms behind this. ELISA plates were coated with native human CII and blocked with human serum albumin, after which sera with varying concentrations of anti-CII were added. Serum-free mononuclear cell cultures from healthy blood donors were then added, and after 20 hours cytokine levels in supernatants were measured using ELISA. Parallel wells without cell cultures were developed as anti-CII ELISAs. Sixty-five RA patients and 10 control individuals were investigated cross-sectionally, and 17 patients with anti-CII followed longitudinally for 1–5 years. Fcγ RII and Fcγ RIII were blocked with specific antibodies. Cell depletion/enrichment studies were performed to define responder cells. High sensitivity CRP measurement was performed with nephelometry. 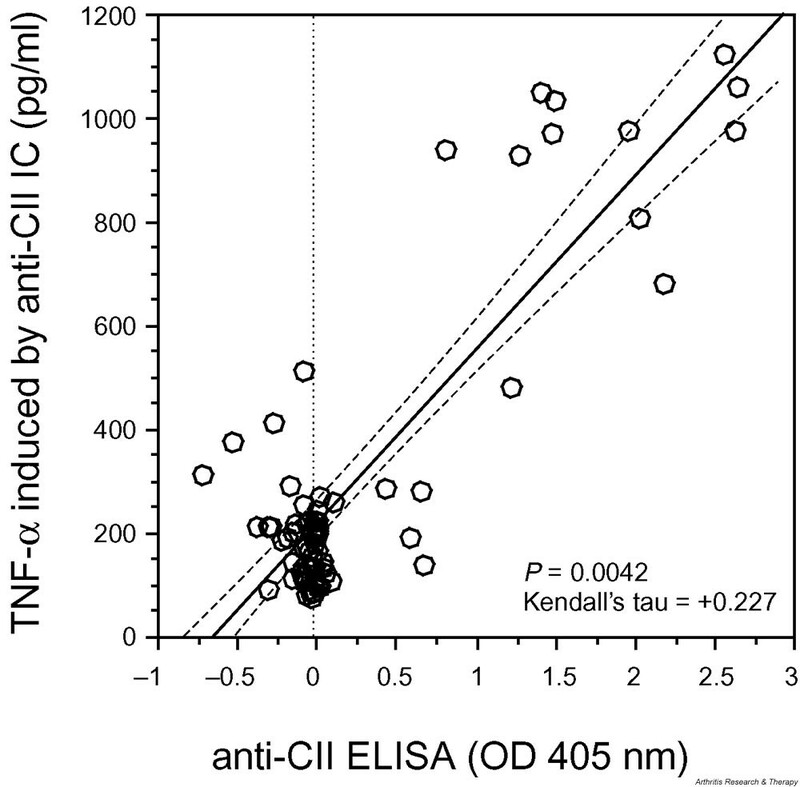 Surface-bound IC containing CII induce TNF-α, IL-1β and IL-8 from mononuclear cells via Fcγ RII. Cytokine production correlated highly with anti-CII levels in the cross-sectional investigation. Five out of the six longitudinally followed patients with highest anti-CII levels also showed parallel changes in anti-CII OD, cytokine induction and CRP. Depletion/enrichment studies showed monocytes to be the responding cells. Surface-bound anti-CII IC can form in inflamed joints. Such IC can induce proinflammatory cytokines such as TNF-α, IL-1β and IL-8 from monocytes via Fcγ RII. Most serially followed patients with high anti-CII levels showed parallel changes in anti-CII, induced cytokines and CRP. This may imply mechanisms of pathophysiological importance in the subpopulation of RA patients with high levels of anti-CII.